Mormons believe that Joseph Smith was a prophet of God and that the church he founded is the restored Christian church. 1805 - Birth Joseph was born on December 23, 1805, in Sharon, Vermont. He was the fifth of eleven children born to Joseph Smith, Sr. and Lucy Mack Smith. I was answered that I must join none of them, for they were all wrong; and the Personage who addressed me said that all their creeds were an abomination in his sight; that those professors were all corrupt. This event is called the First Vision. By necessity Mormons believe that an apostasy must have taken place soon after Jesus' apostles died in order for the church Joseph founded to be regarded as the only true Christian church today. 1823 - Angel Moroni Joseph claimed that at age 17 he was visited by an angel named Moroni, who informed him of an ancient record engraved upon gold plates and buried in a nearby hill named Cumorah. Moroni allegedly visited Joseph once a year for five years until 1827, when Joseph was allowed to obtain the plates to translate them. 1827 - Emma Hale Joseph married his first wife Emma Hale. He would eventually have over 40 wives. 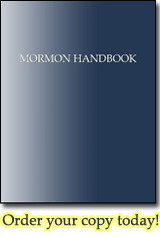 1830 - Book of Mormon / Church of Christ Joseph published the Book of Mormon, his alleged translation of the gold plates, purporting to be "another testament of Jesus Christ". He also founded the Church of Christ, later renamed The Church of Jesus Christ of Latter-day Saints in 1838. 1844 - Death The Governor of Illinois had Joseph put in jail for ordering the printing press of a newspaper critical of his church destroyed. An angry mob stormed the jail and killed him along with his brother Hyrum. Joseph's unexpected death created a succession crisis as to who would lead his church. 1847 - Migration to Utah Those who sided with Brigham Young as Joseph's successor followed him to the Salt Lake basin in Utah. 1852 - Polygamy Brigham Young, the second and longest serving Mormon prophet, publicly acknowledged the practice of polygamy within the church. 1890 - The Manifesto Under pressure by the federal government, Wilford Woodruff, the fourth Mormon prophet, issued a manifesto prohibiting the practice of polygamy. 1978 - Priesthood for Blacks The LDS church lifted its ban on denying blacks its priesthood. Today The LDS church has over 14 million members worldwide, with about half in the United States. It operates a global missionary force of 50,000. The church claims to be led by continuous revelation from their sitting prophet and by twelve apostles.